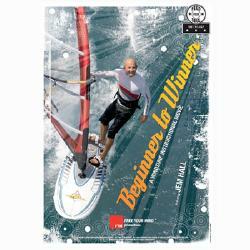 Winner to Wavesailor, instructional windsurfing DVD is the latest offering from FREE YOUR MIND PRODUCTIONS. This is the most comprehensive wavesailing instructional windsurfing DVD ever produced. It builds on the massive success of Beginner to Winner and forms the third and final part of the feed your soul trilogy, after Beginner to Winner and Feed your Soul – Freestyle. FYM trilogy producer, and top rider, Lars Petersen and Jem Hall guide you to be the best wavesailor you can be. From your first day getting out in the waves to your first loops; from down the line in cross off perfection to making the most of cross on waves, this movie has it all. Rotations are covered both backwards and forwards right up to doubles. Forward loops, back loops, push loops and more are covered in depth and from all angles, with special live coaching sections by Jem Hall in his own inimitable way. Jem Hall shows you how to get into forwards, and live coaches 2 people on how to get their jumps and riding better. In the Fault Analysis section, Jem Hall identifies problems that hinder your progress and inspires you to take action and perform better with the right actions. waves. You will learn from the red-hot action demos by top sailors including Kauli Seadi, Jason Polakow, Phil Horrocks, Alex Mussolini, Robby Swift and of course Lars Petersen. The footage has been gathered from Jeri / Brazil, Chile, Maui and Europe and in true BEGINNER TO WINNER style is over 3 hours long in chapters that are easy to follow and navigate. Winner to Wavesailor is the Beginner to Winner of wavesailing. Come with us on the journey from Winner to Wavesailor. Clicking Buy Now redirects you to 2XS a top windsurf retailer.